When it comes to building a website, you have a lot of potential avenues available to make real money online. While there are always the tried-and-true methods like display ads and affiliate marketing, one approach that many successful bloggers and marketers are now taking is launching a membership site. With a membership site, you restrict access to some or all of your content to different membership levels. This way, you can charge a subscription fee for access to each level. If you want to launch your own membership site, WordPress is a great platform to get started with. But in order to create your membership site, you’ll need to choose from the many WordPress membership plugins out there. To help you make your decision, here are 6 best membership site plugins for WordPress. Which WordPress Membership Site Plugin Should You Choose? MemberMouse is a powerful membership plugin that offers pretty much every feature a membership site needs. It gives you more flexibility than most of the other plugins, but at a significant cost (that I’ll discuss in a second). Membership levels – the standard subscription offered by all of the other plugins on this list. Bundles – sells access to specific posts/pages for a one-time purchase. You can also drip content to visitors. And it even lets you create automated upsells/downsells, as well as coupons and trial offers. If you like optimization, you’ll also enjoy the built-in split testing feature. With its lengthy and detailed feature list, MemberMouse is definitely the most flexible membership plugin out of the box. MemberMouse isn’t GPL. That violates the WordPress ethos and means MemberMouse’s code isn’t an open book. MemberMouse operates on monthly SaaS-style billing. This can quickly get very expensive. If you’re willing to pay a premium for features, MemberMouse starts at $19.95 per month for sites up to 1,000 members. MemberPress is another popular and well-respected WordPress membership plugin. Like Restrict Content Pro, it’s designed to be an all-in-one solution for your membership site needs. Restrict access to pages, child pages, posts, custom post types, etc. Detailed coupon creation and management. Drip content and content access expiration. Built-in affiliate program on Business and Developer plans – usually you would need to pay for another plugin to get this. bbPress integration for member support forums. 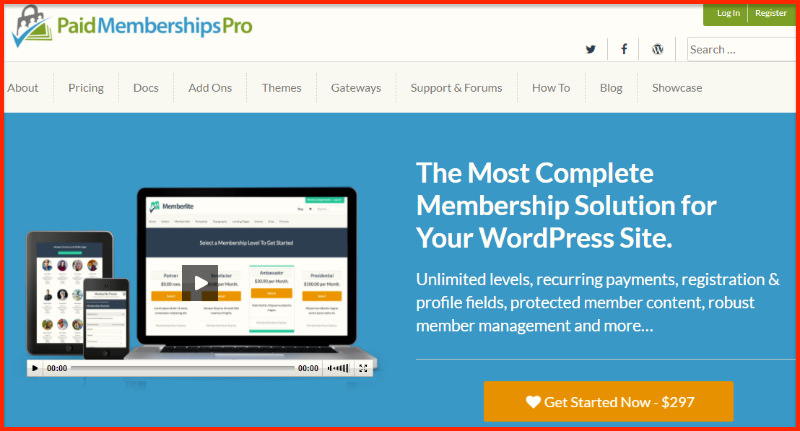 MemberPress, along with Restrict Content Pro, is consistently rated as one of the best WordPress membership plugins by Chris Lema (a WordPress membership expert). And it’s also affordably priced, starting at $119 for use on one site. Restrict Content Pro is a flexible plugin from Pippin’s Plugins, the same team behind the popular Easy Digital Downloads plugin. It’s designed to be a “full-featured, powerful membership solution for WordPress”. To match that goal, Restrict Content Pro offers you all the core features you need to launch a membership site with WordPress. Unlimited subscription levels, including free, trial, and premium membership packages. Drip content to release content to members on a specific schedule (with an add-on). Integrations with most popular payment gateways. Reports to see your site’s earnings and membership growth. Pro-rated payments if members upgrade or downgrade their plan (this feature is fairly unique). In general, Pippin’s Plugins has a reputation for creating products built on clean, well-documented code. So if you or your developer wants to customize things further, you’ll appreciate Restrict Content Pro’s detailed developer documentation. Restrict Content Pro’s plans start at $99 per year and range up to $499 for a lifetime license and all premium add-ons. Paid Memberships Pro is a free core plugin that offers 64 premium add-ons to extend its functionality. While it does start out free, you’ll almost always need to purchase some of the premium add-ons to get access to important functions. One nice thing about Paid Memberships Pro is that it comes with its own dedicated theme called Memberlite. Unlimited subscription levels, including custom trial periods. Integrations with most major payment gateways. Drip content and expiration dates. One fairly unique feature of Paid Memberships Pro is that you have the option to offer a free excerpt of restricted content to non-members. As mentioned, the core Paid Memberships Pro plugin is free. But to get access to most of the good features, you’ll likely want to purchase the Plus package for $297. This will give you access to all of the add-ons and unlimited support tickets. Unlike all of the previous plugins, WP-Members is a 100% free plugin listed at WordPress.org. But before you get too excited, be aware that you’ll be taking a big step back in terms of functionality and ease of use by going with this free option. Still, if you just want a lightweight membership solution, it offers solid, albeit basic, functionality. Restrict all or some of your content to registered members. Add in-line registration forms with more fields. Set up custom dialog/error messages and emails. While you’re going to miss out on many features of high-powered membership sites, WP-Members does include over 100 action and filter hooks for developers to extend the plugin’s functionality. You can also purchase a membership at RocketGeek for access to premium support and code snippets. WooCommerce Memberships takes a slightly different approach from the other plugins on this list. As its name suggests, WooCommerce Memberships integrates into WooCommerce rather than working as a standalone solution. This means that you can not only restrict your content, but you can also restrict access to your eCommerce store to create a private purchasing club on WordPress. Give access to a membership as part of purchasing a product. Restrict product viewing or purchasing to certain membership levels. Give members special discounts on product purchases. Standalone memberships of varying levels. Restricted posts, pages, and other non-WooCommerce content. With that being said, to get the most out of WooCommerce Memberships, you’ll likely want to purchase the WooCommerce Subscriptions plugin as well, which can get a little pricey. WooCommerce Memberships starts at $149, while WooCommerce Subscriptions starts at $199. Each plugin on this list is a worthy candidate to create a membership site. But if I had to narrow things down, I would most likely recommend Restrict Content Pro and MemberPress. Both offer all of the core features membership sites need and at affordable prices. MemberMouse also has an amazing feature list. But the fact that it’s a monthly SaaS-style subscription which doesn’t follow GPL licensing is a major downside. If neither of those things bothers you, their amazing features definitely make it worth considering. And finally, if you just want to create a basic membership site without spending any money, WP-Members is definitely a solid choice. Have you ever created your own membership site? If so, which plugin did you end up choosing? Let’s hear your thoughts in the comments below! Really I very try to found the membership but can’t find. But after read this article my thought is clear. Now I thought to purchase Restrict Content Pro. Thanks for this post., Harsh. Just an additional note from Advanced Ads: If you are planning a membership area on a site with adverts and you want to be flexible and free in managing your ads, you may take a second look on Paid Memberships Pro. Thankyou for this helpful post. It is very useful for me because i want to launch some content for my premium member with membership login and password. I was familiar with first two but now i know best 7 membership plugin. Thank You and Keep Writing Useful Post like this. Thanks so much for sharing the information. We used some of them and found them very useful in defining and restricting user roles. Infact we started our website based on your valuable suggestions, keep up up the goodwork. Thanks for this great list of community building plugins. I am a tech blogger and I have a question from you that If I have an adsense account approved for My BlogSpot blog can I use it for my own WordPress blog. If yes, then how please tell me. I am running a woocommerce website with membership and I have used WooCommerce Memberships plugin. In my personal experience, you always need to customize any plugin to meet your requirements. I did customization to meet client’s requirements and found It’s awesome plugin and fulfill all requirements of a professional website. Thank you for recommending this plugin. Thanks for writing about all these awesome membership plugins. It will be useful for those who want to start a membership site to sell their products/services/courses etc.. Membership sites provide good and regular source of income. Great reviews on these plugins. Once again thanks for your great share.